Choi Kyung-Ju (Korean: 최경주, pronounced [tɕʰwe ɡjʌŋdʑu]; born 19 May 1970), commonly known as K. J. Choi, is a South Korean professional golfer who currently plays on the PGA Tour. Since turning pro in 1994, he has won more than twenty professional golf tournaments worldwide, including eight on the PGA Tour, making him Asia's most successful golfer. His most notable victory came at the 2011 Players Championship, and he has spent 40 weeks in the top-10 of the world rankings. Choi turned professional in 1994 after fulfilling his military obligation. After establishing his career on the Korean Tour, where he picked up his first professional win in 1995, and the Japan Golf Tour, where he won twice in 1999, Choi qualified for membership of the U.S.-based PGA Tour by finishing tied 35th at the 1999 qualifying tournament. He was the first Korean to earn a PGA Tour card. In his rookie season in 2000 he finished 134th on the money list and had to requalify, but since 2001 he has been a consistent performer on the tour. In 2002 he became the first Korean to win on the PGA Tour at the Compaq Classic of New Orleans, and followed it up with another victory at the Tampa Bay Classic later that year. In 2003 he won the Linde German Masters on the European Tour, his first and only win to date on the European Tour. Choi won Jack Nicklaus's Memorial Tournament in 2007. He mentioned on CBS during the AT&T National that he read Jack Nicklaus's "Golf My Way" book early in his golf career, which assisted him in becoming the golfer he is today. Choi won the first AT&T National hosted by Tiger Woods at the Congressional Country Club in Bethesda, Maryland. The trophy is a small replica of the U.S. Capitol building in Washington, DC. He made a spectacular sand trap shot on the 17th hole for a birdie to clinch the win over Steve Stricker by 3 shots. Choi was a crowd favorite and threw his golf ball into the crowd after holing his sand shot on the 17th hole. In August 2007 he reached the top 10 of the world rankings for the first time. In January 2008, Choi won the Sony Open in Hawaii and rose to world number 7. In March 2008, Choi reached fifth place in the rankings. After his 7th PGA Tour victory at the 2008 Sony Open in Hawaii, Choi donated $320,000 of his earnings to the victims' families of a warehouse fire in Seoul, South Korea, which killed over forty people. Choi won his fourth title on the Asian Tour in Malaysia in 2009 at the Iskandar Johor Open, which was reduced to 3 rounds due to inclement weather. In May 2011, Choi won The Players Championship at TPC Sawgrass in a playoff against David Toms. Choi had a one shot lead going down the 18th hole in regulation time, but Toms made birdie while Choi could only chip and putt for a par taking it to a sudden-death playoff. Both players found the green at the first extra hole, the 17th, and then missed with their attempted birdie efforts. Toms however also missed the return four footer for par leaving Choi with a three-foot par putt to seal victory. This to date is the South Korean's biggest PGA Tour victory. Following his win, Choi donated $200,000 to help victims of the tornadoes that ravaged the southeastern United States in April. In February 2016, Choi finished runner-up at the Farmers Insurance Open to Brandt Snedeker, during a Monday finish to the weather disrupted event. This was notable because it was the first time in Choi's PGA Tour career that he did not convert a 54-hole lead or co-lead into a win. He was previously 5 for 5 in converted 54 holes leads to victories. The result moved Choi up 197 places in the world rankings from 334th to 137th. Choi continued his good early season from at the Northern Trust Open where he finished in a tie for fifth, despite holding the co-lead during the final round. This moved Choi to just outside the top 100 at 102nd in the rankings. Choi represented South Korea in the WGC-World Cup in 2002, 2003, and 2005, and was a member of the International Team in the Presidents Cup in 2003, 2007, and 2011. Choi was born in Wando, South Korea. He currently resides in Southlake, Texas, near fellow South Korean PGA Tour player Yang Yong-eun. He is a devout Christian and member of the Korean United Methodist Church. He has donated much of his money to charity through the K.J. Choi Foundation. Before picking up golf Choi was a competitive power lifter, being able to squat 350 pounds (159 kg) as a 95-pound (43 kg) 13-year-old, thus aptly nicknamed "Tank" by South Koreans. K.J. 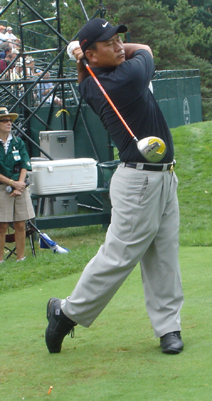 hits a drive during a 2005 PGA Championship practice round at Baltusrol Golf Club. ^ a b c d "The Ultimate K.J. Choi Fan Site". 25 May 2011. Retrieved 16 June 2011. ^ "69 Players Who Have Reached The Top-10 In World Ranking" (PDF). Official World Golf Ranking. Retrieved 8 November 2013. ^ Kim, Sang hun (22 September 2003). 최경주, "유럽대회 자주 출전하겠다". Yeonhap News (in Korean). Retrieved 30 April 2013. ^ "K.J. Choi Wins Wire-to-Wire at the Sony Open in Hawaii and Climbs to World Number 7". Official World Golf Ranking. 14 January 2008. Archived from the original on 8 November 2013. Retrieved 8 November 2013. ^ "KJ Choi lands Players Championship at TPC Sawgrass". BBC Sport. 15 May 2011. Retrieved 16 May 2011. ^ "K.J. Choi to give $200,000 to relief effort". ESPN. Associated Press. 18 May 2011. Retrieved 8 November 2013. ^ Nichols, Bill (8 April 2010). "Since historic win, Korean golfer finds balance with family in Southlake, at Dallas driving range". Dallas Morning News. Retrieved 11 April 2010. ^ a b "K.J. Choi is a golf god who gives back – CNN Belief Blog". CNN.